October 29, 2011  Bani Walid was one of the last pro-Moammar Gadhafi bastions to fall to revolutionary forces. It's also the seat of the Warfalla tribe, the largest in Libya. 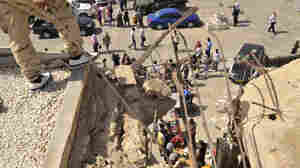 In the wake of Gadhafi's death, NPR's Lourdes Garcia-Navarro reports the tribe is aggrieved and the city is seething. On an Aug. 10 tour organized by Moammar Gadhafi's governement, an unidentified man lies in a hospital bed in Tripoli. He was allegedly injured during NATO airstrikes a day earlier. October 26, 2011  Many Libyans have praised NATO for helping opposition forces topple Moammar Gadhafi. But in one Tripoli neighborhood, residents say a NATO bomb killed five civilians. October 24, 2011  Libya's liberation was declared over the weekend, and residents of Sirte, Moammar Gadhafi's battered hometown, are beginning to return to their homes. October 23, 2011  Libya's Transitional National Council could resign Sunday to make way for a new interim government that will guide the country through elections. Libyans who went to see Moammar Gadhafi's corpse Saturday in Misurata had their own thoughts on what lies ahead and what the former dictator's death means to them. NPR's Lourdes Garcia-Navarro reports from Misurata. A check point between Misrata and Beni Walid, Libya. October 17, 2011  Forces loyal to Moammar Gadhafi terrorized the Libyan city of Misrata during the war. Because it never fell, the city became an icon of the revolution. But Misrata is gaining a reputation for a militia that is carrying out acts of vengeance, looting and restricting movements in and out of the city. 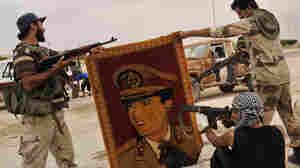 Anti-Gadhafi fighters point their guns at a carpet depicting Moammar Gadhafi after taking the village of Abu Hadi, the deposed Libyan leader's birthplace, on Oct. 3. Regime loyalists who fled to the village find themselves grappling with the realities of a new nation. October 13, 2011  Abu Hadi, which is near the besieged city of Sirte, has become a refuge for those who can't or don't want to be a part of the "new" Libya. Some of these people may have blood on their hands. Others may not. 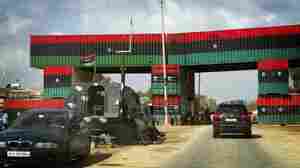 But what happens to them will help determine whether the new Libyan government lives up to its democratic aspirations. October 13, 2011  The Libyan National Transitional Council says its fighters now control most of the Gadhafi stronghold of Sirte. The battle for the city has been bloody, with civilians caught in the middle and accusations of brutality on both sides. October 10, 2011  Anti-Gadhafi fighters are pushing ahead with their offensive in Sirte, the last main bastion of support for the ousted Libyan leader. It's been slow going for the anti-Gadhafi forces, despite air support from NATO. Guy Raz talks to NPR's Lourdes Garcia-Navarro for more. David Gerbi stands in front of the main synagogue in Tripoli, Libya, on Sunday. An exiled Libyan Jew, he has returned after being away for more than 40 years. He hopes to restore the synagogue and create an atmosphere of tolerance in the aftermath of Gadhafi's ouster. October 3, 2011  The last remaining members of the Jewish community in Libya were driven out more than 40 years ago. Despite this, David Gerbi came back to Libya to help the rebels as they ousted Gadhafi in a six-month uprising. Gerbi hopes to re-establish the Jewish community, but he has run into problems. October 3, 2011  Residents of the Libyan capital Tripoli are growing increasingly angry at abuses said to be carried out by armed anti-Gadhafi groups. Some allege that once rebel fighting brigades have become criminal gangs, looting and intimidating at will. September 21, 2011  The uncertainty surrounding the Palestinian's bid for statehood has kicked up mixed feelings in the West Bank and Israel. Far away from the posturing and news stories, ordinary Palestinians and Israelis have their own thoughts on the idea. September 16, 2011  Palestinian President Mahmoud Abbas announces that he will present the Palestinian bid for statehood recognition directly to the U.N. Security Council next week. This, despite the threat of a U.S. veto. Abbas said U.N. recognition of a state on territory seized by Israel in the 1967 Six-Day War will allow the Palestinians to negotiate with Israel as equals. September 15, 2011  Israel has never had many friends in the Middle East, and now it is facing serious problems with traditional partners like Turkey and Egypt. A Palestinian bid for statehood at the U.N. next week is expected to add to Israel's sense of isolation in the region.